England proved that they are the No.1 ODI side in the world as they crushed West Indies to a six-wicket win in the first ODI at Bridgetown on Wednesday. It was a high scoring affair as West Indies posted a massive 360/8 in 50 overs. England chased down the target in 48.4 overs, courtesy of brilliant hundreds from Roy and Root. West Indies captain Jason Holder won the toss and decided to bat first. John Campbell made a positive start to his innings while Chris Gayle took his time to settle. Campbell was dismissed for 30 runs by Chris Woakes. Gayle and Campbell added 38 runs for the opening wicket. West Indies posted 49 for 1 at the end of 10 overs. Chris Gayle and Shai Hope took time to settle before both batsmen smashed the England bowlers to all parts of the ground. Hope reached his half century off 48 balls while Gayle reached his fifty off 76 balls. Shai Hope was dismissed for 64 by Ben Stokes. Gayle and Hope added 131 runs for the 2nd wicket. Shimron Hetymer came to the crease and scored a quick-fire 20 off 15 balls. Chris Gayle continued his aggressive intent and reached his 24th ODI century off 100 balls. England bowlers kept picking wickets despite West Indies batsmen aggressive approach. Chris Gayle was dismissed for a brilliant 135 runs. West Indies posted a massive total of 360 for 8 in 50 overs. Chasing the target of 361 runs to win, England openers Jason Roy and Jonny Bairstow got the team off to a flying start. Jonny Bairstow was dismissed by Jason Holder for 34. Roy and Bairstow added 91 runs for the opening wicket. Jason Roy reached his fifty off 30 balls and continued to put pressure on West Indies bowlers. It was a brilliant batting display by Roy who made the batting look easy and reached his century off just 65 balls. Devendra Bishoo struck by dismissing the dangerous Jason Roy for 123. Joe Root and Jason Roy added 114 runs for the 2nd wicket. Joe Root reached his fifty off 55 balls while England captain Eoin Morgan took time before taking on West Indies bowlers. Eoin Morgan was dismissed for a brilliant 65 off 51 balls. Joe Root completed his century off 96 balls and was dismissed by Jason Holder. England won the match by six wickets with eight balls to spare. 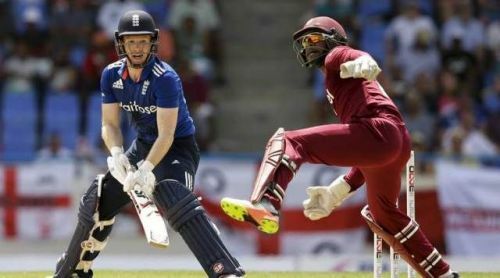 Brief scores: England 364 for 4 in 48.4 overs (Jason Roy 123, Joe Root 102, Eoin Morgan 65, Jason Holder 2/63) beat West Indies 360 for 8 in 50 overs (Chris Gayle 135, Shai Hope 64, Darren Bravo 40, Ben Stokes 3/37, Adil Rashid 3/74).